The first days and weeks of braces can be painful and frustrating. The inside of your mouth can get all torn up, your lips may get cut, and your teeth hurt. I know how miserable this feels because I had braces for three years as an adult. Take heart; it will pass! On day soon you'll realize that you've totally forgotten that you're wearing braces because they won't hurt anymore. Really! When your mouth sores heal, scar tissue will form on the inside of your mouth which helps prevent new sores in the exact same location. I remember when I first got my braces. I had ceramic uppers put on first. Then about 10 days later I had metal braces put on my bottom teeth. Eating was a challenge. I had to chew very slowly and take small bites. Of course at first I could only manage soft food, but after about a month I was able to eat a fairly normal diet, avoiding really hard foods (like nuts or hard crusty bread). Tortilla chips felt like little daggers – it was six months before I could eat those comfortably! When does the pain from braces stop? Truthfully, it doesn't totally stop until your braces come off. The first weeks are the most painful and things tend to settle down a bit after that. But throughout your treatment, you will find that as your teeth shift, you will get new pains and mouth sores. That's why it's a good idea to have an "arsenal" of products and remedies to turn to for the duration of your treatment. That way, you won't have to suffer while you hunt around for something to make you feel better -- you'll already have it at home! If you have a wire poking into the very back of your cheek, it will be almost impossible to cover it. If a poking wire is tearing up the back of your cheek, call your orthodontist and go in to go get it clipped. Sometimes you don't even need to make an appointment – many orthodontists can just do a fast clipping for you “on the fly.” Please don't suffer with this, because a badly torn up cheek could get infected! During those first challenging weeks, there are many things you can do to keep yourself comfortable. Warm Salt Water Rinse - This is fairly easy to make: just mix about a teaspoon of table salt into a glass of warm tap water and stir until all the salt is dissolved. Rinse your mouth several times per day with this warm solution. The salt water solution soothes your mouth sores and helps them heal. Pain Killers - You don't need to take heavy pain killers when you have braces. A couple of Advil every 6 hours or a couple of Tylenol every 4 hours can do the trick, as long as your doctor says it's OK. Always read the label and follow the instructions on Advil or Tylenol (or any pain reliever) to ensure you don't take too much. When in doubt, ask your doctor. Always take them with food, and don't take Advil (or any NSAID) together at the same time with Tylenol – that could cause stomach bleeding! Cold Foods – Treat yourself to some frozen yogurt, ice cream, or a cold drink such as ice water. The cold helps dull the pain. You could even apply cold packs to your mouth, although it is rarely necessary to go to such a drastic measure. Wine – I'm not telling you to drink, especially if you are under the legal limit. But if you are legal drinking age, a glass of wine could help ease the pain a little bit. Just don't over-do it! And remember, red wine will stain clear elastics, so stick to the white variety! Obviously be careful of mixing alcohol with any pain killers. Bite Wafers - Your orthodontist or dentist may have given you a bite wafer. If you bite down on it for a few minutes several times per hour, it could help relieve your pain. The motion of biting helps circulate blood to your gums which can ease some pain. Don't bit too hard – just a little pressure is enough. If your dentist didn't give you a bite wafer, you can buy one from us. We sell them in several different flavors. Click to order Bite Wafers. PulsatePro - Think of this as a Bite Wafer on steroids! The PulsatePro delivers low frequency vibrations to your mouth and brackets, which helps to increase circulation to your gums and mouth. 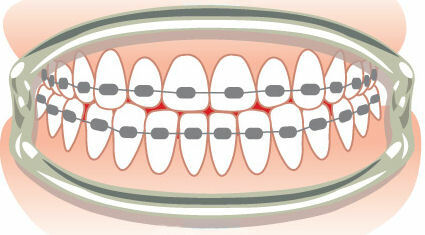 The increased circulation helps create blood flow which helps to relieve the pain from your braces. Use it just 20 minutes a day to help keep your braces comfortable. PulsatePro is hundreds of dollars less than Acceledent, and can be used indefinitely (it does not expire and stop working like Acceledent). Replacement mouthpieces are available, so several members of a household can use it if needed! Click to order PulsatePro. OraChill - This is a really cool product, which is the result of a lot of scientific research. If the pressure of braces makes your teeth hurt, OraChill can provide a non-drug way to relieve the pain. You freeze this product and then apply it under your gums. It blocks the pain that comes from the nerves inside your mouth and jaw. The result is, the nerves in your mouth and jaw temporarily stop transmitting pain impulses to the brain! It really works! Click to order OraChill. Rinconol PRN – I love this stuff. It tastes weird but it works great! Swish it in your mouth for one minute and then spit it out. It creates a protective barrier on your mouth sores which lasts for many hours. 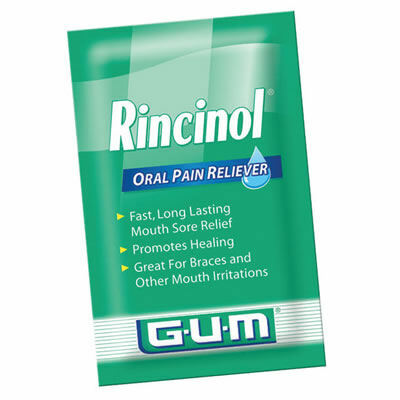 This is a great product to use if you have a lot of mouth sores because they are all treated at once. You can sometimes find bottles of Rincinol PRN in your local drugstore. We sell handy individual-use packets of this product. Click to order Rincinol PRN. Canker-X – This is a gel which forms a protective barrier on your mouth sores, and helps soothe them with Aloe Vera. You apply it directly to the individual sores. It does not sting or burn when you apply it, and it does not have a bad taste. The barrier that Canker-X forms gives you many hours of blessed pain relief. You can sometimes find little tubes of Canker-X in drugstores. We sell handy individual packets of this product, which are more hygienic than the tubes. 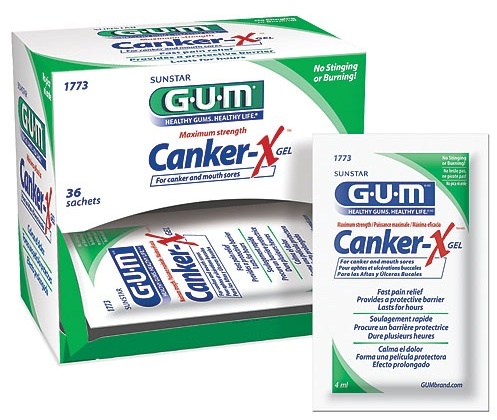 Click to order Canker-X. Dental Wax and Dental Silicone - The simplest way to stop your mouth from getting torn up is to create a barrier between your brackets and the inside of your mouth. There are several ways to do this. The most common is to use dental wax. Your dentist probably gave you some dental wax. Just break off a little bit with your fingers, hold it for a few moments to warm it up, then apply it right on the brackets that are causing the mouth sores. Use as much as you need. Remember to take it off before you brush your teeth or it will totally gunk up your toothbrush! You can find dental wax in most local drug stores, but here at DentaKit.com, we sell it in 10-packs and bulk boxes of 50 packets. We also sell dental silicone (Ortho-Sil and BraceGard) which lasts longer but can be a little harder to apply (the brackets need to be perfectly dry for silicone to stick). In addition, there are new OrthoDots, which is orthodontic silicone with a special moisture-activated backing. 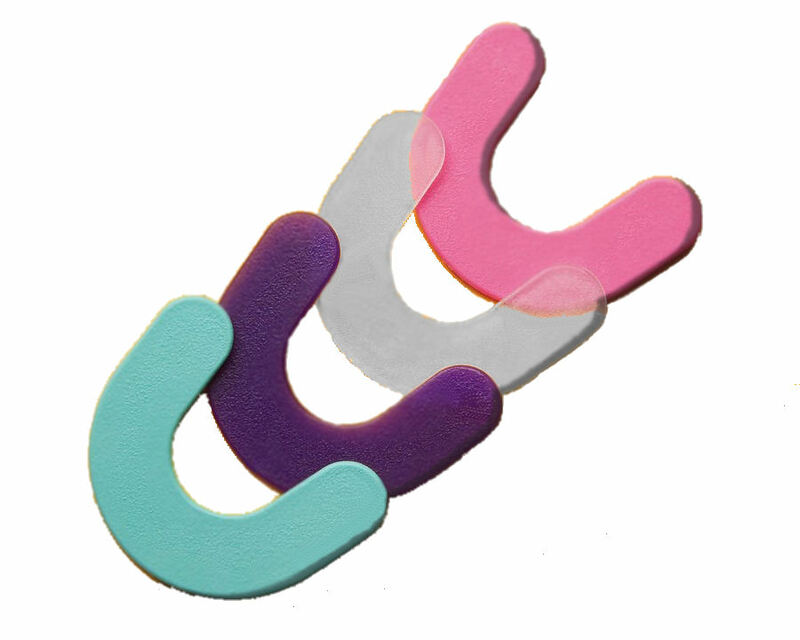 Your brackets don't need to be dry for OrthoDots to stick, and they stay on your brackets for 6 to 8 hours. Click to order Dental Wax , Dental Silicone, or OrthoDots. 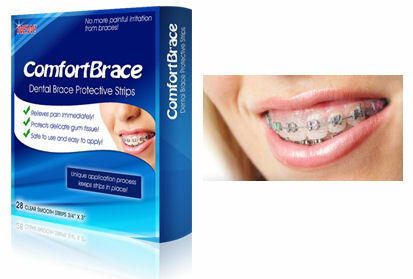 ComfortBrace Strips – This is an ingenious product. It looks like a “WhiteStip” but is thicker and contains no whitening chemicals. 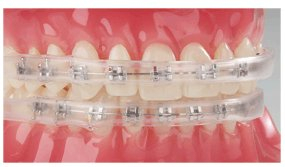 It adheres gently to your teeth and brackets, forming a protective barrier between your braces and the inside of your mouth. You can wear it for an entire day and even eat and drink with it on. Our customers tell me that they love this new product. Click to order ComfortBrace. Comfort Covers and Lip Protectors – These products are made from flexible soft plastic. They cover your brackets, which helps soothe existing mouth sores and prevent new ones. We sell three different types of these sort of lip protection products. They come in sets of two (one for the top teeth and one for the bottom teeth). You can cut them with scissors for a custom fit. Some people like to buy one set of each to see which product works best for them. If you play a wind instrument, we also sell the BraceGuard Kit, which enables you to make a custom guard. Because BraceGuard is pink it may not be right for non-musicians – however, it would work well if you have lingual braces (behind the teeth). Click to order Comfort Covers or Lip Protectors or the BraceGuard Kit. Bracket Jacket – Bracket Jacket is a custom braces guard that you form at home with hot water (thermoformed). It covers both the front and back of your teeth and prevents discomfort caused by sharp brackets and wires. Great for lingual braces (on the back of the teeth)! This clear guard allows teeth to move, and leaves space to wear rubber bands. Complete instructions are included with the product. Click to order Bracket Jacket. 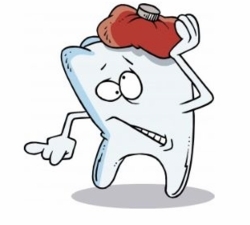 Tooth pressure pain and mouth sores are no fun, but they will pass. As your treatment progresses, you will only occasionally feel pain or get sores from your braces. Armed with a little knowledge and a few good products, it will only be a bump in the road to your new smile.